Week Three and It's Heating Up! The tensioned Seawater Greenhouse, ready for netting! With these structures being completed, this means that the construction now shifts to a new phase, starting next week, of structure fit-out, net installation, electrical installation and plumbing, before we move onto the final phases of planting and systems testing. 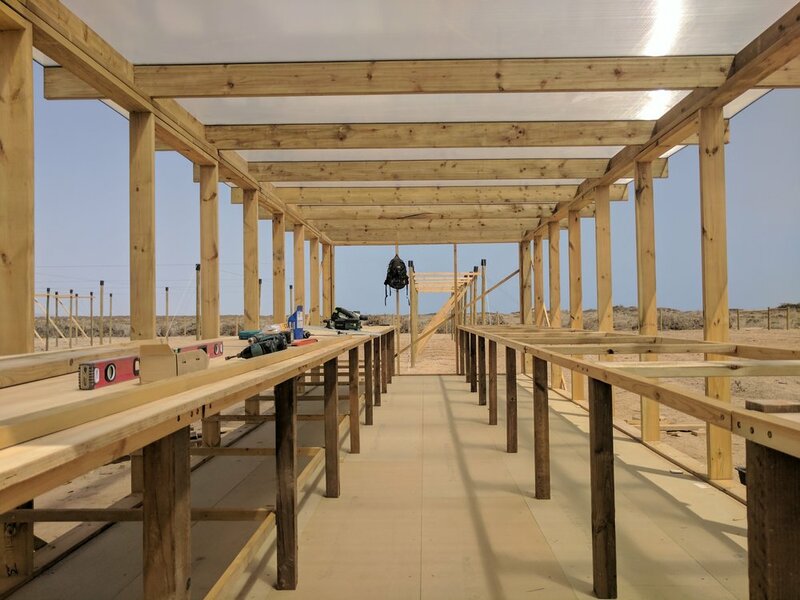 The final steps to finishing the structures of the two Seawater Greenhouses this week began with finishing the installation of the cable anchors, which involved using a power drive rod to force them into the ground. After this step was completed, the next step carried out was to install both the guy wires and the structural wire-rope cables. The last step was to carefully tension all the cables for both Seawater Greenhouses. Christopher Strange has spent week three focused on completing the structures of the Salt Shed and Work Building; his week has been spent primarily focused on the Salt Shed as the majority of the Work Building construction was completed last week. Despite Chris’s colleague, Adam Paton, departing Somaliland at the end of last week, Chris has worked diligently to finalise both structures by the end of the week, whilst also providing a great energy to the site. On the last day of week three, we arranged for an excavator to come to site for the digging and installation of three wells, that will be the source of our salt water and brackish water, to be fed to our RO system. Excavator action has the whole team involved! This job is still ongoing and is due to be completed the first day of week four. Week three saw the completion of some of the hardest jobs of the entire construction and for our day off we took a team vacation trip to the beautiful and breath-taking mountains of Sheekh, an hour’s drive south of Berbera, for a well-deserved day of fun. Here the mountains are evergreen and the views are stunning, and the altitude meant that we could escape the 40+ degree temperatures of Berbera for the day!